HomeStudy-MaterialSSC CGL 2017 Tier I All Shift Que Paper(Revised) in Single PDF File. 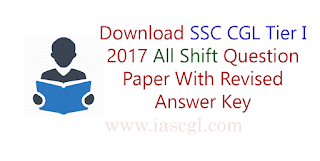 SSC CGL 2017 Tier I All Shift Que Paper(Revised) in Single PDF File. Staff Selection Commission(SSC) conduct Combined Graduate Level(CGL) exam every year for the recruitment of Grade A,B,C officer level post over the country. This Year SSC conduct Tier I exam from August 5th to 23rd 2017. And a tentative Answer key released for the same and asked candidates to raise issue if any mistake in tentative answer key. Now, after all that, SSC released revised Answer Key of Combined Graduate Level Exam(CGLE) Tier I ,2017. Candidate can download Question Paper Asked in All Shifts of CGL Tier I 2017 examination from the Direct Link Given Below.